The 5Rs defining open content. As defined by Open Definition, "A license is a document that specifies what can and cannot be done with a work (whether sound, text, image or multimedia). It grants permissions and states restrictions. Broadly speaking, an open license is one which grants permission to access, re-use and redistribute a work with few or no restrictions." There are a number of open licenses that allow for content to be used in a variety of ways. This guide focuses on Creative Commons; however, to find out about additional open licenses, use the resources below. CC BY This license lets others distribute, remix, tweak, and build upon the work, even commercially, as long as they credit the creator for the original creation. 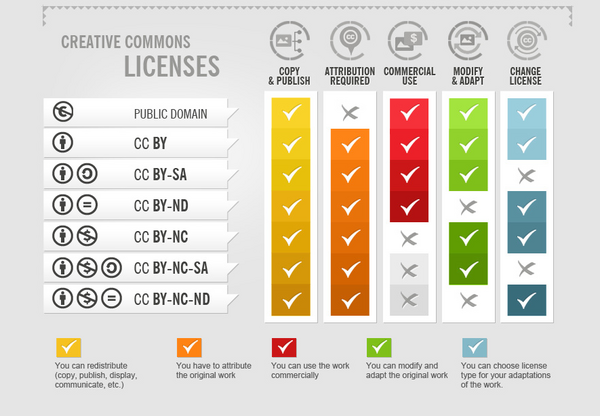 This is the most flexible and accommodating of the available Creative Commons licenses. Recommended for maximum dissemination and use of licensed materials. CC BY-ND This license allows for redistribution, commercial and non-commercial, as long as the licensed work is passed along unchanged and in whole, with credit to the creator. CC BY-NC This license lets others remix, tweak, and build upon the work non-commercially, and although their new works must also acknowledge the creator and be non-commercial, they don’t have to license their derivative works on the same terms. CC BY-SA This license lets others remix, tweak, and build upon the work even for commercial purposes, as long as they credit the creator and license all new creations under the identical terms. This license is often compared to “copyleft” free and open source software licenses. All new works based on yours will carry the same license, so any derivatives will also allow commercial use. This is the license used by Wikipedia, and is recommended for materials that would benefit from incorporating content from Wikipedia and similarly licensed projects. 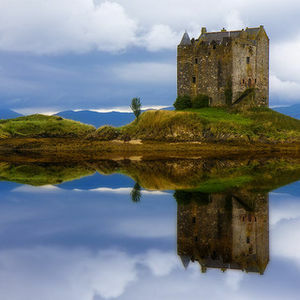 CC BY-NC-SA This license lets others remix, tweak, and build upon your work non-commercially, as long as they credit the creator and license their new creations under the identical terms. CC BY-NC-ND This license is the most restrictive of the six main licenses, only allowing others to download your works and share them with others as long as they credit the creator, but they can’t change them in any way or use them commercially. License Text and Icons by Creative Commons Organization and is licensed under a Creative Commons Attribution 4.0 License. the author's name, screen name, or user ID, etc. If the work is being published on the Internet, it is best practice to link that name to the person's profile page, if such a page exists. the work's title or name (if applicable), if such a thing exists. If the work is being published on the Internet, it is best practice to link the name or title directly to the original work. For in-depth examples on citing Creative Commons images, please see the Creative Commons Image Citation Guide from the UBC Copyright Site. Attributing Creative Commons Materials A 9-page guide from Creative Commons Australia on best practices for attribution of Creative Commons licensed materials. How to attribute Creative Commons licensed materials for Teachers and Students: a 7-page guide for Teachers and students from Creative Commons Australia on how to attribute Creative Commons materials. A guide created by UBC Library dedicated to open education and open access resources. The following guides were developed to suggest tools and sources for finding open education resources. While there are many more resources available to you, the following sources have been evaluated or curated by librarians to make the searching process easier. An open education repository is an online storage system that allows educators to share, manage and use education resources. The repository contains a collection of learning items that support instruction. These items include: open textbooks, lesson plans, quizzes (e.g. iclickers, etc. ), videos, animations, handouts, interactive activities and tools (e.g. apps), and powerpoint presentations. UBC Library has created a guide of vetted open education resource repositories. 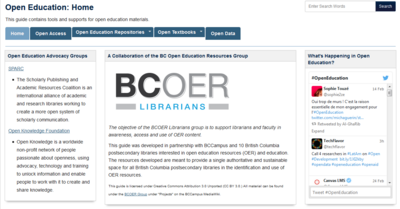 The repositories have been evaluated according to the Open Education Resource Repositories (OERR) Rubric created in collaboration with 10 academic libraries in British Columbia. The assessment process is ongoing and this page will be updated as new OERR's are added. UBC Library's Open Collections are publicly-accessible collections that reflect the research interests of the UBC community and beyond. The basic idea of Open Access is simple, make research literature available online, without price barriers and without most permissions barriers (aside from attribution). There are a number of open access journals that can be used when providing instruction in open environments. Directory of Open Access Journals - This site contains more information on Open Access publishing, as well as a directory of nearly 10,000 Open Access, full-text, and often peer-reviewed scholarly journals. These journals are freely available online, and typically allow authors to retain the copyright to their work. 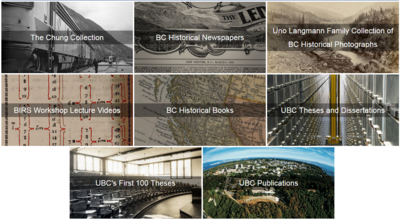 UBC Library's Open Collections include digital photos, books, newspapers, maps, videos, theses and more. These publicly-accessible collections are constantly growing and reflect the research interests of the UBC community and beyond. Open Collections also allows you to run an API. Run powerful queries, perform advanced analysis, and build custom views, apps, and widgets with full access to the Open Collections' metadata and transcripts. Uniformity is the most important part of citing in the wiki as there is no official citation style. It's important to add enough information that a reader can track the citations. This may mean a link to the resource or the full citation information (i.e. author, year, title, etc.). For the purpose of the cases studies, we will use a simplified version of APA style. Book Last Name, First Initial. (Year). Title of the Book. Place Published: Publisher. Retrieved from: URL (if available) Imrie, R., Lees, L., & Raco, M. (Eds.). (2009). Regenerating London: governance, sustainability and community in a global city. Chicago: Routledge. See Help:Footnotes and References to learn more how to add citation in Visual Editor mode. <ref> </ref> Adds the citation information to the wiki entry. <references/> Creates the reference/bibliography at the end of the wiki entry. This is automatically updated when you add new citations. <ref name="Ethics"> Naming a citation allows you to use it multiple times without re-writing the citation. Environmental ethics expands the study of ethics into the non-human world. UBC Library paid resources are available to access by students, staff, and faculty only. This means that all content in open environments (like this wiki) need to be linked directly to UBC Library and not uploaded to the wiki space. However, to link to a Library resource, you will need to create permanent URL, or PURL. A PURL will allow you to link to a specific resource while off-campus. The PURL will "trigger" system to authenticate users and ensuring that the link will work for off-campus users who have a valid CWL. You can also use the PURL generator created by UBC Library. The PURL generator can be found on the EZproxy Toolkit. This page was last edited on 4 January 2019, at 22:24.